Like oak tree planting, maple tree planting may be done in the springtime or the fall, but fall is usually the best season to plant trees. Fall's cooler temperatures and adequate rainfall ease the tree's transition into its new home and decreases transplant shock and stress. Maple trees are large, deciduous trees that grow throughout the world. In the United States, they are more common in the northern states. Many people know maple trees for their spectacular fall color. Some maples, such as the sugar maple found throughout New England, put on quite a show each autumn with golden, ochre and crimson leaves that seem to glow in the autumn sunlight. There are dozens upon dozens of varieties of maple trees, each with its own unique requirements and conditions. When selecting maple trees, planting location is of paramount importance. Maples grow with their roots near to the surface, and if planted too close to a sidewalk or driveway, the roots can crack and uplift cement walkways over time. Maples grow to be 20 to 100 feet tall, with a large, rounded canopy that casts dappled to dense shade through the summer months. You'll also want to select a location where the tree won't cast too much shade over the rest of the garden. Since maples grow to be very tall, be sure the site selected to plant your maple tree is far enough away from homes, garages, outbuildings and power lines so that it won't destroy anything if a branch comes down during a storm. Norway Maple (Acer plantinoides): Grown in gardening zones 3 through 7 since around 1750, the Norway maple is the typical maple planted along suburban and city streets. It's extremely hardy, tolerating almost any growing conditions people can throw at it, from polluted city air to dry soils. It's also quite easy to transplant, making Norway maple tree planting easier than for other species. Sugar Maple (Acer Saccharum): Perhaps the most popular maple of all, the sugar maple is the tree known for its gorgeous fall color. It's shade tolerant, but doesn't like having its roots disturbed, so be very selective about the planting site. It's difficult to move once it's in the ground. Hardy from zone 4 through 8, the sugar maple grows to be around 75 feet tall and about 30 feet wide. Japanese Maple (Acer palmatum): The graceful branches and leaves of the Japanese maple make wonderful specimen trees in the garden. Japanese maples are slow growing and stay small, so they're perfect to enjoy near the home. They grow 15 to 25 feet tall and need a moist, well drained soil to thrive. First, dig a hole twice as wide and as deep as the root ball of the tree. The root ball is the part covered in burlap, cloth or plastic. Place the soil you dig out of the hole on the side to use as fill later. Mix a good compost or well-rotted manure into the soil.Some gardeners advise leaving the burlap or root covering on the root ball. Readers Digest provides planting information with photographs on how to plant a maple tree with the root ball covered in burlap. Some experts advise making small cuts in the burlap to allow the roots to poke through. If the covering is plastic or a plastic derivative, be sure to remove it since plastic cannot decompose. Trees purchased at the nursery in plastic containers should be removed completely from the container before planting. If you've purchased bareroot trees, be sure to plant them as soon as you receive them. 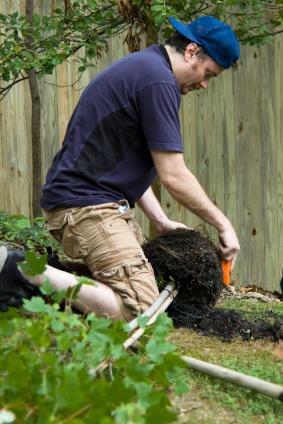 Place the roots into the hole and fill the area around the roots with the compost and soil mixture. Tamp it down with a shovel or your foot. Water thoroughly, allowing the water to soak through, and water again. When you're finished planting and watering, spread mulch around the planting area. Now you can enjoy your beautiful new maple tree for many years to come.